Romhacking.net - Review - No More Passwords. Saving is Great! No More Passwords. Saving is Great! 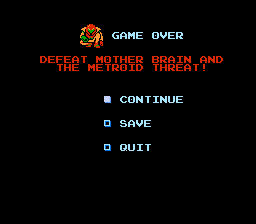 I think the improvements in this hack are tasteful, and they enhance the Metroid experience. 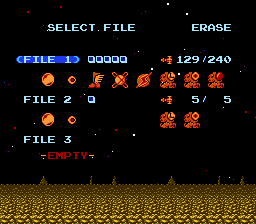 The hack adds the ability to save up to three games, similar to Zelda, and it shows the items that have been collected on the save screen. It’s really nice. Within the game play there are two new features: the map, and the ability to combine the ice beam and wave beam. The map appears when the game is paused, and it’s really useful for getting through the game quickly especially if you only have a vague recollection of where things are. 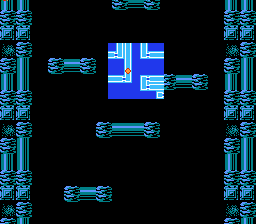 Also, the game was designed to be like a maze, and a lot of rooms look very similar. It’s easy to get lost, but the map helps to keep you oriented. I wish the map was larger, but it is scrollable with the d-pad. It would also be nice if the map would continue to scroll while the d-pad is being held down instead of continually having to press the d-pad in order to scroll. The ability to combine the ice beam and wave beam is really great. I don’t mind that you cannot turn this feature off. It seems like the ice beam by itself is more powerful than I remember, but I haven’t verified that. “the player’s health is now saved”. To save: pause the game, and then press UP + A on the second controller. 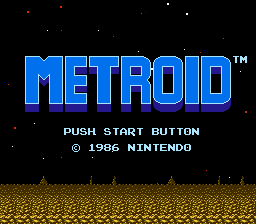 I have been playing the patched ROM on my NES using the Everdrive N8. It works flawlessly and it’s fantastic!